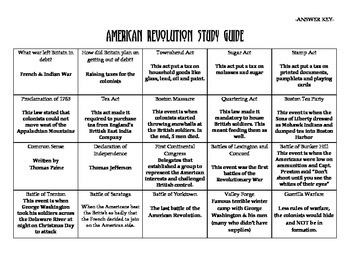 American Revolution (or Revolutionary War) study guide that includes key terms, people, and events. It is a 2 page or 1 page front/back assignment. It comes with a student worksheet which is blank and a teacher's answer key which has the answers on the worksheet. It is just one document with pages 1-2 being the student copy and pages 3-4 being the teacher copy. These "answers" go with my American Revolution Test (that is also on TpT) obviously there is much more information about each term, person, or event. How I use this in my classroom: I hand out the worksheet and have the kids work silently on their own for 10 or so minutes (they can use notes if they have them but I encourage them to try on their own first). I love to walk around while they do this and get a feel for how much the class is remembering and some terms that might be extra tricky. Then I have them work with a neighbor for 10 or so minutes and try to fill out as much as they can. Then we go through the study guide together and I make sure they know the information they'll need for the test on each term, we also discuss what other things they learned about as we go. 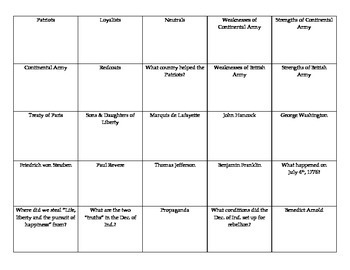 Then we like to play American Revolution Jeopardy (also on my TpT) before we take the test!